How important is it that women are being featured more now in a male-dominated sport? 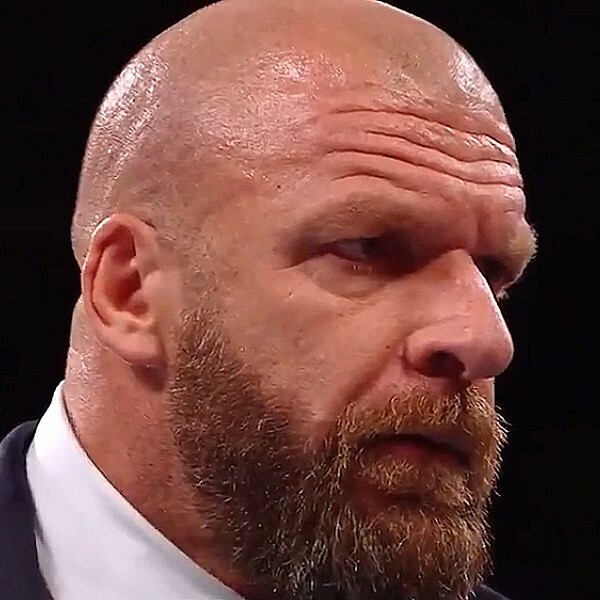 Triple H: I think the word male dominated is changing, right? And I think that's the great thing. I have said it since the beginning of me getting involved with the development of talent... I don't see the difference [between men and women], I just see talent. It doesn't matter to me, male, female, doesn't matter; where they're from in the world, doesn't matter. I just want the best. I want the best athletes, most personality, people that fans are going to be captivated by their personalities and their personas and want to see them perform. And then knowing that as athletes they'll be able to put on a show like no one else can. That is the goal. For me, I think it is phenomenal, but I'm happy that I feel like soon we'll be getting to a point where it's no longer a big deal because it just is. It's not a male dominated anything… It's WWE, and it's for anybody. Stephanie McMahon: Our audience is 40 percent women, and our women weren't always treated as equals. They were treated as secondary or tertiary-type characters, and it wasn't until our fans started a hashtag called #GiveDivasAChance -- that was a reaction to a 30-second tag match that happened on Monday Night Raw -- and that hashtag trended worldwide for three days. And it was so loud that our chairman and CEO -- my dad, Vince McMahon -- responded and said "We hear you, keep watching give Divas a chance." And at WrestleMania that year AT&T Stadium Hall of Famer Lita went out, and she unveiled the new championship belt. She announced the re-branding of the Divas division to the women's division. And announced our women were going to be called Superstars, same as the men. And since that time our women have been more regularly featured in main events on all television and pay-per-view programing. There was the first ever Hell in a Cell match, first ever women's Money in the Bank Ladder match, the first ever women's Elimination Chamber match. I'm going out of order. The first ever women's Royal Rumble match, and then this past December we had the first ever women's match in the UAE Abu Dhabi, and our fans started a chant that said "this is hope"… I just can't imagine what that must have felt like for everyone in that arena to be a part of that movement. I think the women's evolution represents something so much bigger than the WWE, and I'm just so proud that we are a part of it and helping to amplify it and make it as big as we possibly can. For anyone who hasn't experienced WrestleMania before, what can you tell them? Triple H: I can tell you, this is especially as an executive, there's a lot of times we meet… potential sponsors, business partners, or anything that aren't necessarily… aware of the product -- they're aware of the reach right, but they've never been before. I see that a lot. I've seen that a lot in the last five or six years. I don't know of anyone that comes to… WrestleMania… and doesn't leave and go "Oh my God that was the greatest spectacle I've ever seen." We're different than anything else… When you talk about the Olympics or something there's a series of events, but they do this unbelievable opening ceremony and then some Olympic events take place, or a massive opening then a soccer game happens or whatever. With us, the spectacle and the grandeur takes place the entire event... It's this kind of attack on all your senses, so to speak. When you're there, the excitement, the energy it's infectious. It's hard not to become involved. And for me, I always feel like it's one of those things that you can go to where people can come to from around the world, people you've never met in your life, and you can sit in that crowd and if you say "Oh what's this guy's deal what's his storyline?" The person behind you will go "Let me tell you what he does, his thing is this." And all of a sudden everybody comes together and it's like a big giant 70,000 person family reunion of people you've never met before, just all having a great time together. And that, to me, is what's awesome about it. Without sounding like a goofy cliché, it brings people together and that's really cool. Do you feel Ronda Rousey signing a full time WWE contract can open the doors to other athletes outside to pursue a career in the WWE? Triple H: I do, you know the performance center and our recruiting efforts have sort of changed that perception outside of our world anyway. There's been a lot of, whether it be NFL players or soccer globally or anything else that have had a desire maybe to try and want to do this but never had that pathway in front of them. The pathway is now there, I say it all the time: What I'm doing internationally with all these other markets is I'm trying to create pathways. I'm bringing a recruiting team there trying to create an environment where if somebody says "Man, I love that, and I'd like to try and do that," there's a way for them to do that. Ronda took that path that wasn't there before. We created that path, she came to us; she approached us probably about the same time we approached her, but the pathway was there and I think now she will open a lot of eyeballs of athletes around the world to say "Well, why can't I?" Stephanie McMahon: We recruit from the Olympics; we recruit from rugby, football overseas; we recruit from everywhere. I do think Rhonda has brought heightened awareness. She is arguably one of the world's greatest athletes. She is also just a tremendous star. She just exudes this energy and charisma that you can really connect to because you have to have the total package. Athleticism alone is not enough. And I think Rhonda speaks to the caliber of athleticism that is in WWE but it also speaks to the women's evolution, and I can't wait to see how her presence will give the women's evolution even more weight.